Thiru Kavithalam or Kabisthalam as known today is one of the 108 divya desam temples situated near Kumbakonam. The perumal in this sthalam is called 'Gajendra Varadhan'. The sthalapuranam of this temple is also associated with that of the elephant Gajendran similar to that of Ashtapuja perumal of Kanchipuram.Gajendra performed pooja to Maha Vishnu using the lotus flowers from this pond. One day a crocodile caught Gajendra and there was a big struggle. The elephant was about lose the battle when cried 'Adimoolamae' seeking Sri Narayana's help.Sri Narayana rescued the elephant Gajendra from the crocodile's mouth using his 'chakra' cutting the neck of the crocodile. He then gave motcham ( salvation) to the elephant here. . The Moolavar of this temple is Sri Gajendra Varadhan. Moolavar in Kidantha Kolam in Bhujanga sayanam facing East . Prathyaksham for Anjaneyar and for Gajendran. Thayar of this sthalam is Ramamani Valli (Potramaraiyaal). 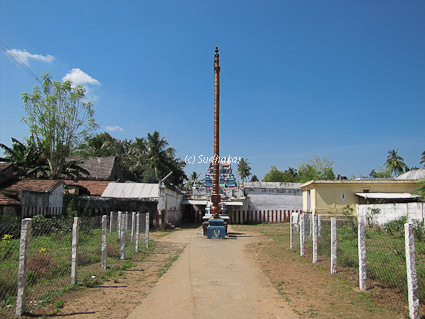 Temple location It is situated near Papanasam. Temple Timings The temple is open from 7:00 AM till 10:00 am and from 5:00 pm till 7:00 pm. This being a very small temple with very few people visiting, the archakar(temple priest) may go off early. Please check with people in the neighbourhood if you do not find him. Local buses from Kumbakonam to Tiruvyaru will go via this place. There are also local buses from Papanasam. You can also hire a taxi from Kumbakonam and see some more temples around here. if you drive your own car, it is much easier and you can cover other temples nearby.